This is McKevin’s mother and little sister. She has no husband to work and make money for the home and she is unable to find work. Many of you know McKevin. McKevin’s family was recently evicted and a friend took them in. However, where you see her squatted with here little girl and holding a piece of carpet, this is where she, McKevin and little sister were sleeping. There was a larger room that became available and we got the family moved in to. However, we do not have the extra funds available to pay the rent. 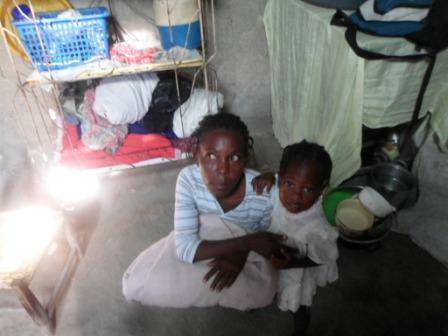 We would love to get a sponsor for this family to pay the rent of $125 U.S. per year. This would be a great blessing to the family so as not to worry if they will be homeless again.